I am extremely passionate about identity design and brand development. It’s my favorite area of the advertising/marketing industry. Although identity is not only a part of what branding is, it’s where my knowledge and experience is most applicable. Therefore, it’ll be what I’ll be discussing in this article. 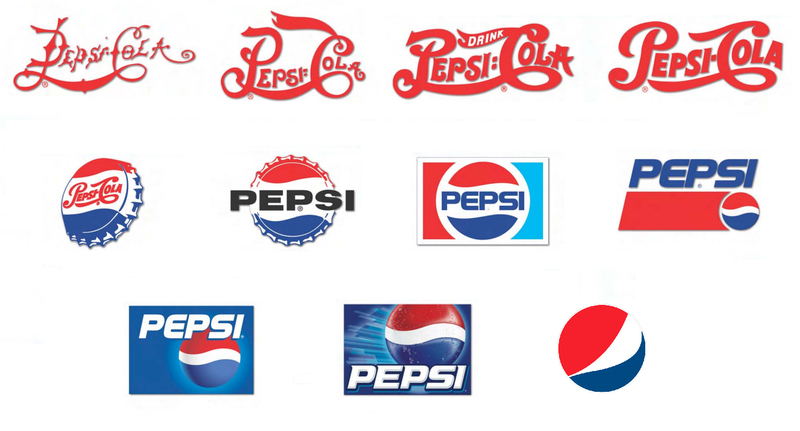 There are quite a few reasons why a brand identity evolves over time. I will share a few great examples. It’s very important for a brand to stay relevant in an ever-changing environment in order to continue capturing a new and often a younger market share. This can be a tricky proposition, as you want to appeal to a younger customer, you also have to be cognitive of your existing loyal base. This is why you’ll often see well-established brands slowly update their identity through subtle changes over time. Let’s look at a few of my favorite examples. I can’t help but to notice this throughout the television entertainment industry. For nearly two decades now the face of television has drastically. In an arena that once was dominated by sitcoms, we saw most programming moving towards reality. This increased profits for the networks in a unimaginable way. We are now seeing a shift again. Viewership of reality-based television has started to fall flat. Also, many customers are choosing ‘cutting the cord’ and digesting content through alternative means. It seems these days; networks are competing with original content. A great example of this is AMC. Once known as American Movie Classic, where viewers could view classic films. AMC saw the change in trends coming and dropped their name to the initials we are so familiar with now. This allowed them to branch away from the classic movies that defined their original brand and focus on creating some of the industries top rated original programs. Raking in the all that advertising revenue along the way. Sometimes the drive for a brand identity update is a company that moves from start-up to a market leader. One I’ve personal worked on is Vonage. I think you will remember those wonderfully memorable commercials Vonage used to advertise their service in their infancy. As they and the VoIP industry and grew and Vonage became a clear leader, there was a need to update their image. Their commercials moved more toward showing family lifestyle and used a features/benefits approach. It was time for their logo to mature as well. The basic Bank Gothic font treatment that worked well when they were young just wasn’t cutting it any longer. I was fortunate to be working at an ad agency in San Francisco at the time that had Vonage as a client. They asked us to submit some design concepts for consideration. They were looking for and identity that fresh, fun (yet professional), approachable and modern. Two of my concepts were selected for focus group testing and one of those was eventually selected. That identity is still being used today. Just like the about example, sometimes and emerging industry evolves very rapidly and its important for a brand to recognize this to stay ahead of the pack. Years ago I had worked with a client who was a medical cannabis delivery service in Northern California. At that time the industry wasn’t new, but branding and marketing efforts were basically non-existent. That was rapidly changing though, as competition was increasing and the stakeholders were discovering what other industries had been developing for generations. Within about a year of helping Northstone Organics with their branding and marketing, it was clear that we needed to update their logo ever so slightly. Again we didn’t what to depart from the original so much that the current base wouldn’t recognize them. Just enough to tighten it up and stay ahead of the completion. The focus of this logo was to showcase that their products were sun grown in natural sunlight with organic fertilizers, unlike most of what was being sold in the bay area at that time. In conclusion, I hope you found this article informative and insightful. If you’re in need of brand identity development or consultation, I’m available to help your business large or small. Contact me today to get started.